The license code must be supplied to upgrade Auto PeakTrace 5 to Auto PeakTrace 6. This information is contained on the Licensing Information window of Auto PeakTrace 6. Open the options window and click on License button. Mouse over the License Code and right click to copy. 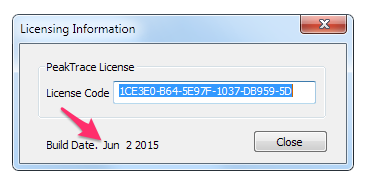 Email the License Code to Nucleics (or your local supplier). The code should be a series of numbers and letters seperated with five dashes. If you are using the Linux version of PeakTrace you will need to install Auto PeakTrace 6 on a Windows computer and then plug in the PeakTrace USB Key as there is currently no way to obtain the license code using the command line version of PeakTrace.